Written by Xolisa Ngubelanga | Directed by Simphiwe Kaya. Fire, capable of both disaster and cleansing, has proved to be the oppressed people’s weapon of choice during protest and has become characteristic of the South African struggle. A detained student leader uses fire to connect the trials of FeesMustFall with that of his father during the state of emergency. 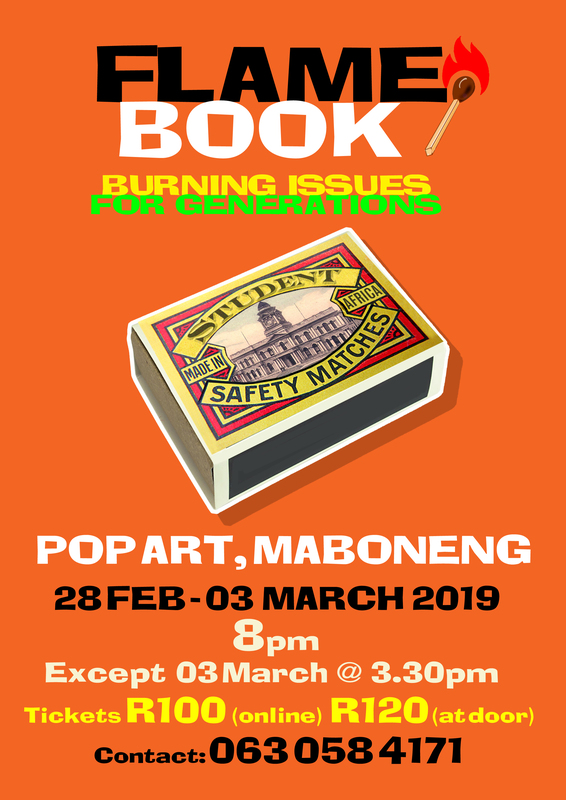 Flamebook premiered at the National Arts Festival and is a 2017 Standard Bank Ovation Award winning theatre production for excellence. On 22 September 2017 the Port Elizabeth City Hall will be marking 40 years since it was burned by a fire of unknown course. 06 September it will be 40 years since the detention of Steve Bantu Biko in Port Elizabeth. Does Steve Biko’s detention and later death have anything to do with the burning of the Port Elizabeth City Hall? No official account of the fire has confirmed or denied this. Flamebook is a theatre performance that reinvestigates these incidents to see if there is any probable connection between them.